CW Answer: Yes JB, it’s not only possible, it’s ideal. Even though exercises with rings and parallettes don’t require external loading, you can build just as much strength and muscle as you can with iron, no matter how heavy that iron is. In fact, if you know which exercises to do, you can break through hypertrophy plateaus and achieve newfound muscularity with exercises on the rings and parallettes. You only need to look at the muscular development of the Olympic gymnasts who specialize in the rings events to know how powerful those exercises are for muscle growth. Every single guy has an upper body that most of us would commit a felony to possess. Well, I know many guys who’ve been lifting weights for more than 10 years and their upper body looks nothing like those gymnasts. If I could turn back the clock I would’ve started training my upper body on the rings 10 years ago and I’d have a lot more muscle than I do now. So the question is: How do you incorporate exercises with rings and parallettes? 1. Choose High-Tension Exercises: When most people think of maximal strength development, they only think of lifting heavy loads. Even though that’s certainly a way to build maximal strength, the essential factor is tension not load. I’ll use the rings handstand push-up as an example. Most fit guys can only perform a few partial reps of this exercise. And if they can do a full range of motion handstand push-up from the rings, they can’t do many. Therefore, that rings handstand push-up is building maximal strength even though there’s no iron. For maximal strength development, the key is to choose exercises that can’t be performed for more than 10 continuous seconds. This could be a muscle-up, front lever, back lever, handstand push-up or any other body weight exercise. When you follow that rule, you’ll always build maximal strength while achieving maximum recruitment of the high-threshold motor units. 2. Train with Sufficient Volume: To promote hypertrophy, the volume of each exercise must be sufficient. Even though there’s little research to reference with regard to volume and hypertrophy, my empirical data demonstrates that at least five sets is necessary to elicit a strong hypertrophy response. One or two sets of any exercise, no matter how much load or tension, won’t make your muscles grow. You can’t go wrong with 5-10 sets. 3. Perform a Full-Body Circuit: When an exercise mandates high levels of muscle tension (e.g., rings handstand push-up), you need at least three minutes of recovery before you repeat that exercise. Although, this doesn’t mean you should sit around for three minutes. By placing your rings and parallette exercises in a full body circuit you can get at least three minutes of recovery while keeping your workouts relatively brief. Between the rest periods and the time it takes you to finish those four exercises, you’ll have three minutes of recovery before repeating an exercise. Of course, the options are endless when it comes to exercise selection or the number of exercises you have in a circuit. The above is just an example. The trick with rings exercises is that many of them don’t fall perfectly within a “push” or “pull” category. That’s one of the reasons why I started my Rings and Power tour. In that 2-day seminar you’ll learn how to program all of the rings, parallettes, and body weight exercises into the ultimate power and muscle-building system. To find out how to reserve a spot in the Rings and Power seminar, go to this link. This entry was posted in Gain Strength, How To Get Ripped by Dr. Chad Waterbury. Bookmark the permalink. (1) With respect, does your sample circuit betray your bodyweight-only premise, given the dumbbell SLDL ? This calls to mind the usual objection that the deadlift is the one movement for which bodyweight-only cannot suffice. (2) What do gymnasts do for ‘cardio’, if anything ? It seems to me that your sample circuit would probably have me hands-on-knees huffing and puffing. CW: Dale, notice that it’s a dumbbell deadlift – it’s not BW only. As you mentioned, BW isn’t enough. Gymnasts don’t do traditional cardio because their sport doesn’t necessitate it. This is a great new take on training for me. Nice to see some lower body work in there – Gymnasts usually have poor leg development. I assume that a suspension trainer such as the jungle gym XT would work fine for this type of training? Are you going to publish an ebook or other option for those who cannot make it to the seminar? CW: Yes, many rings gymnasts have skinny legs because it’s excess weight to them, but that doesn’t mean we can’t learn from their upper body training. Yes, I’m working on a new product. 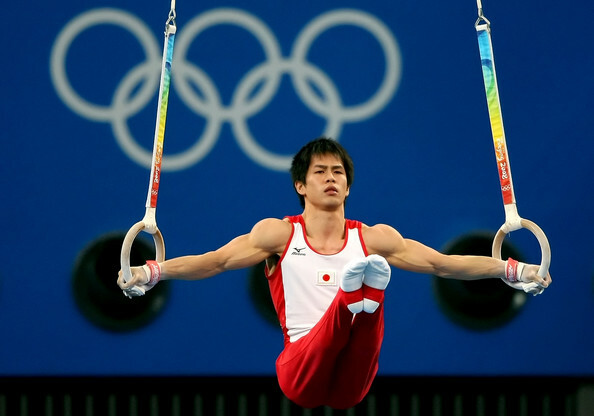 Love the bodies on the male Chinese gymnasts, though… I remark on them every time I catch them during the Olympics ;). Perfect. CW: It takes time to build up the wrists and you must stretch them to increase mobility: especially the wrist extensors. Interesting article , do you have a progressive routine from beginner to advanced I could purchase. CW: I’m working on it. For now, the Rings and Power tour has all the details. Do you still recomend traditional lifts as well as the gymnast type movements? Things like weighted pushups, pullups etc when training for hypertrophy? Also any chance of getting a seminar in eastern washington? CW: Those exercises have a place in some programs. I’m not counting out anything. However, I’m constantly looking for better ways to get the job done. Thanks, Chad. What are your views on training the same body parts every day? Do we really need 48 hours to recover? Is there much research on recovery times? Gymnasts usually work the same body parts every (or almost every) day. True, they’re more prone to injury than lifters, but is that because of their demanding routines or because they train so frequently? CW: You can work up your frequency to the point where you train the same muscle groups every day. But it requires a strategic approach, such as my PLP program. I’ll talk more about it in the future.